Cardio Debate > Cardio Notes > Treatment and Prevention > Anticoagulation in Atrial Fibrillation patients prone to fall – What to do? Anticoagulation in Atrial Fibrillation patients prone to fall – What to do? In subjects with atrial fibrillation (AF) who are at an increased risk of falling, anticoagulation is often regarded as problematic and not infrequently avoided, in many cases, despite a clear indication for its use. Recommendations in this specific group of patients are based on expert consensus but not on objective trial data. 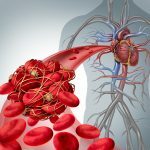 Recently, the ENGAGE AF–TIMI 48 (Effective Anticoagulation with Factor Xa Next Generation in Atrial Fibrillation–Thrombolysis In Myocardial Infarction 48) trial specifically assessed the “relative efficacy and safety of edoxaban versus warfarin in patients with atrial fibrillation judged to be at increased risk of falling”. (1) – The identification of patients at risk of falling was rather subjective in the study and may have introduced a degree of selection bias. A critical assessment of the study results (1) by Elaine M. Hylek and Darae Ko, (2) highlighted the fact that patients at increased risk of falling were not randomised and the optimal choice of anticoagulant for patients who are prone to falling cannot be definitively answered by this study. Hylek and Ko however agree that “biologically, the non-vitamin K oral anticoagulants (NOACs) should have an advantage as their mode of action does not affect factor VII”. The findings of ENGAGE AF–TIMI 48, if confirmed in further large, multicentre studies may trigger a paradigm change in the management of AF in real life clinical practice. This as a result of the main findings in the study (1) that the use of edoxaban was associated with a greater absolute reduction in severe bleeding events and mortality.